Published February 13, 2013 at 2816 × 2112 in New platform decals reinforce the message: let people off the train before boarding the train! The yellow portion of the platform decal looks good. However, my only question is in regards to the black background white arrows on the outer corners near the door. They seem to “squeeze” themselves on those corners and for some people, like me, suggest that I quickly squeeze through when I see an opening while people are exiting. The problem I see is if everyone starts squeezing in, then everyone starts squeezing in and out. Then you are back to square zero to what we have now. 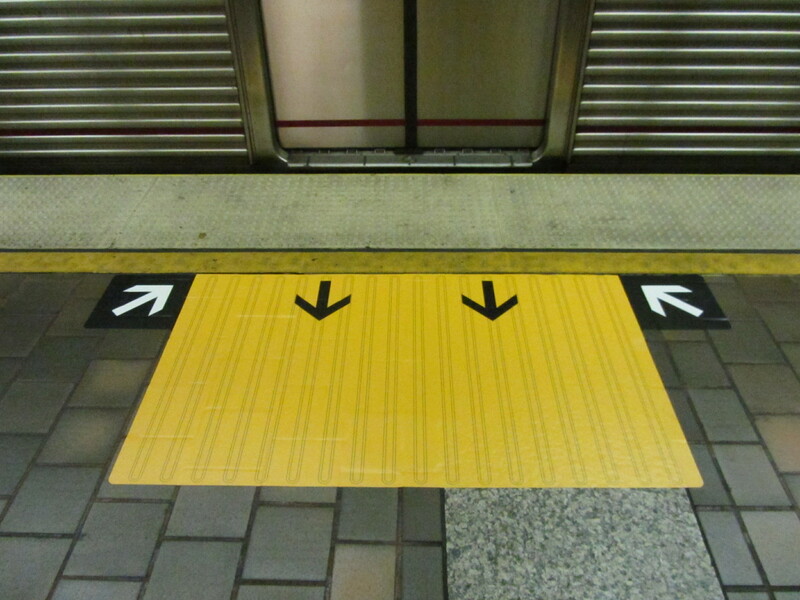 I suggest a simple straight-forward instruction with the words “WAIT HERE” bordering the yellow square. Its more explicit and less suggestive than those corner arrows.